iTunes Users ~ Check Your just for U Accounts for a Deal! 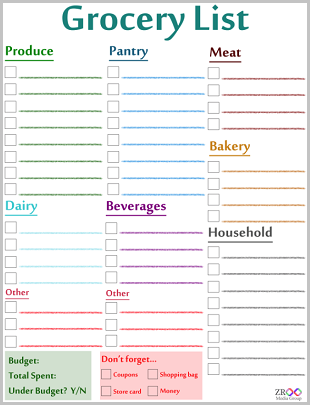 December 16, 2012 · by Zack Reyes · Post may contain affiliate links. See my disclosure policy here. Head over to the Coupon Center of your jfu account and click "special offers". If it's still available, you should see a $15 offer for iTunes. 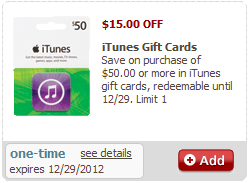 Basically, you get $15 off when you spend at least $50 on iTunes gift cards! Now, if you want to get experimental, try buying a multi-pack, since they are offering an instant 15% discount on iTunes multi-packs. You'll have to have at least $50 AFTER the discount though, so try buying (2) 3-card packs of $10 cards. That would mean your total would be $51 before the $15 off. So you could should get $60 in iTunes gift cards for just $36! That would also give you (6) $10 cards, which would be great for gift giving or stocking stuffers!